If you’re a parent, it is a certainty that you have had to deal with an angry child. Often, we end up in shouting matches with our kids, or we freeze up, not knowing what to do when an angry outburst occurs. Anger is a normal emotion in kids and adults alike. But how we express and deal with our feelings of anger is the difference between living in relative peace and feeling like we are at our wits’ end. Learning to manage angry children and teens is an ongoing process and an important skill to learn. Read on to learn our top 10 rules for dealing with an angry child. 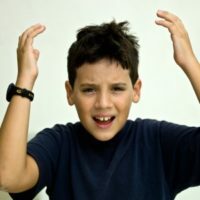 Many times parents deal with angry outbursts by challenging their kids and yelling back. But this will just increase your feeling of being out of control. The best thing you can do is remain calm in a crisis. Think of it this way: even if you get into a car accident and the other driver jumps out and is furious at you, if you can remain calm, they will probably start to relax and be reasonable. But if you come back at them with an aggressive response, and say, “What are you talking about, that was your fault,” the tension just stays at that heightened place. So don’t challenge your child when he’s angry. That’s just adding fuel to the fire. Instead, patiently wait until he calms down. Many parents I talk with fall back on logic when their kids are angry. After all, as adults, we reason through things to defuse tense situations. But, reasoning with an angry kid is always a challenge because they don’t have the same capacity as we do to stop and reason. So when you’re dealing with your angry child, you have to leave that verbal place where you feel pretty comfortable and use different techniques. Saying, “Why are you mad at me? You were the one who forgot your homework at school,” will only make your child angrier. Instead, wait until he calms down and then talk it through later. It’s important to watch your reactions, both physical and mental. Your senses will tell you “Yikes, I’m in the presence of somebody who is very upset.” You’ll feel your heart start beating faster because your adrenaline will be heightened. Even though it’s difficult, the trick is to act against that in some way and try to stay calm. Remember, you’re lending your children your strength in these moments. By staying calm, you’re showing them how to handle anger. By staying calm, you’re not challenging your child to engage in a power struggle. Also, paying attention to your own reactions will also help your child pay attention to himself because he won’t need to worry about you or your emotions. When you don’t respond calmly, your child will work even harder at his tantrum to try to get you to pay attention to him. So you really have to tap into some solid parenting skills to handle the outburst quickly and effectively. In our online parent coaching sessions, we sometimes hear from parents who have lost it and gotten physical with their kids. I took a call from a dad whose teenage son mouthed off to his mom, and the father shoved him. The fight escalated. That’s it. Nothing more. End of story. We all make mistakes from time to time and we apologize, make amends if necessary, and move on. Don’t go into your child’s role in that situation at all because it is an attempt to place the blame on someone else for your actions. Instead, you want to teach your child how to take responsibility and make a genuine apology. Don’t worry, you will have other opportunities to work with your child around being mouthy or defiant. But it’s important to be a good role model and address your role in the fight going south. Remember, if you get physical with your child, among other things, you’re just teaching him to solve his problems with aggression. Again, don’t challenge them when they’re in that mode. Some parents freeze up when their kids throw tantrums or start screaming at them. The parent is emotionally overwhelmed and becomes paralyzed with indecision or gives in to the child. If this is you, you may find that sometimes your child will get angry on purpose to engage you. They’ll bait you by throwing a fit or saying something rude because they know that this will cause you to give in. Don’t take the bait. Don’t get angry and don’t give in. I think parents sometimes have a tendency to negotiate with their child in these situations. Often, parents are having a hard time managing their own emotions and so they don’t know how to coach their child properly at that moment. But remember, if you give in and negotiate, even every once in a while, you’re teaching your child that it’s worth it to act out. Instead, let your child calm down and try to coach them to use his problem-solving skills later. In my opinion, when you refuse to negotiate you’re not being passive. You are making a conscious choice to not get into an argument. You’re saying, “I’m not going to negotiate. I’m going to be calm.” Although it may not seem like it on the surface, all of those choices are actions. You are making a choice to act by not giving in. When your child throws a tantrum, starts screaming, and really loses it, make sure you give him consequences based on his behavior and not on his emotions. For example, if your child swears at you during his angry outburst, give him a consequence later for swearing. But if all he does is stomp into his room and yell about how life isn’t fair, I would let that go. Anger is a normal emotion and kids get angry just like we do. And they need to feel that they have a safe place to let off steam. As long as they’re not breaking any rules and not being disrespectful, I think you should allow them to have that time to be angry. But to your dismay, your child keeps going and you keep escalating the punishment. His anger is out of control and the more you try to punish him in order to force him to stop and get control of himself, the worse he gets. The worst thing you can do is join him and get upset yourself. Harsh punishments that seem never-ending to your child are just not effective and will only make him angrier at that moment. Remember, the goal is to teach your child to get control of himself. Effective and well thought out consequences play a role, but punitive consequence stacking is not the answer. During coaching sessions, I’ll often ask parents about their child’s angry outbursts the following question: “When you and your spouse are mad at each other, what do you do to calm down?” Often, people will say they take a break and do something on their own for a little while until they can calm down and talk it through. This technique also works with your child, but parents often don’t think of it because they feel they should have control over their kids. But remember, when somebody is angry, you can’t reason with them and you can’t rush it. The bottom line is that if you stay there in that anger and keep engaging each other, it will not go away. On the contrary, it only gets bigger. So take a break and come back and interact with each other later when everyone is calm. Admitting that you’re angry and you need some time to calm down is not a weakness. It takes a lot of strength to say these words out loud. Remember, you’re teaching the lesson of how to manage your anger, and that’s exactly what you want your child to learn.